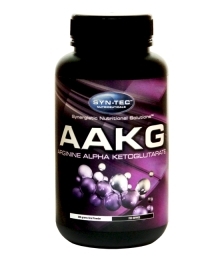 Nitric Oxide Synthesis from Arginine Arginine (usually presented as AAKG – L-Arginine Alpha Ketoglutarate) has been the most popular amino acid for boosting nitric oxide simply because arginine is what the body uses to manufacture nitric oxide. This reaction is performed by a class of enzymes called nitric oxide synthase’s or NOS. Some people think it’s the gas that makes us laugh at the dentist office. Some think it’s the fuel race car drivers use to speed up their cars. But it’s neither. Nitric oxide is a molecule that our body produces to help its 50 trillion cells communicate with each other by transmitting signals throughout the entire body. Nitric Oxide is most popular in the bodybuilding community for it’s ability to provide greater muscular pumps and vascularity by vasodilating blood cells improving blood flow and nutrient absorption. There have been over 60,000 studies done on nitric oxide in the last 20 years and in 1998, The Nobel Prize for Medicine was given to three scientists that discovered the signalling role of nitric oxide. Nitric oxide supplements have been quite the buzz for some years now, particularly in the bodybuilding community. This is largely because an increase in nitric oxide levels is correlated with a better ‘pump’, among other things. Nitric oxide for athletes and bodybuilders Increasing nitric oxide has become the new secret weapon for athletes and bodybuilders. Athletes are now taking supplements with L-Arginine and L-Citrulline to increase the flow of blood and oxygen to the skeletal muscle which can augment strength and endurance. They also use them to facilitate the removal of exercise-induced lactic acid build-up which reduces fatigue and recovery time. Since arginine levels become depleted during exercise, the entire arginine-nitric oxide – citrulline loop can lose efficiency, causing less-than-ideal nitric oxide levels and higher lactate levels. Supplements can help restore this loop allowing for better workouts and faster recovery from workouts.